In a relatively short period, Dynamic Combinatorial Chemistry (DCC) has grown from proof-of-concept experiments in a few isolated labs to a broad conceptual framework with applications to an exceptional range of problems in molecular recognition, lead compound identification, catalyst design, nanotechnology, polymer science, and others. Bringing together a group of respected experts, this overview explains how chemists can apply DCC and fragment-based library methods to lead generation for drug discovery and molecular recognition in bioorganic chemistry and materials science. A comprehensive, single-source reference about DCC methods and applications including aspects of fragment-based drug discovery, this is a core reference that will spark the development of new solutions and strategies for chemists building structure libraries and designing compounds and materials. Benjamin L. Miller is an Associate Professor of Dermatology, Biomedical Engineering, and Biochemistry and Biophysics at the University of Rochester. In addition to his academic credentials, Dr. Miller has industry consulting experience as the founder of Adarza BioSystems and Lighthouse Biosciences. 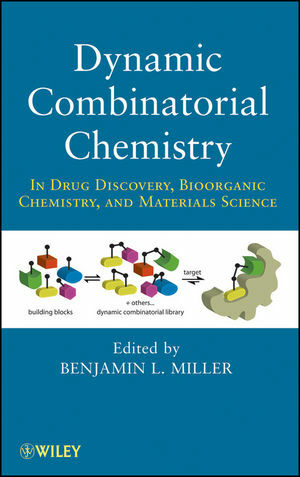 Chapter 1: Dynamic Combinatorial Chemistry: An Introduction (Benjamin L. Miller). Chapter 2: Protein-Directed Dynamic Combinatorial Chemistry (Michael F. Greaney and Venugopal T. Bhat). Chapter 3: Nucleic Acid-Targeted Dynamic Combinatorial Chemistry (Peter C. Gareiss and Benjamin L. Miller). Chapter 4: Complex Self-Sorting Systems (Soumyadip Ghosh and Lyle Isaacs). Chapter 5: Chiral Selection in DCC (Jennifer J. Becker and Michel R. Gagné). Chapter 6: Dynamic Combinatorial Resolution (Marcus Angelin, Rikard Larsson, Pornrapee Vongvilai, Morakot Sakulsombat, and Olof Ramström). Chapter 7: Dynamic Combinatorial Chemistry and Mass Spectrometry: A Combined Strategy for High Performance Lead Discovery (Sally-Ann Poulsen and Hoan Vu). Chapter 8: Dynamic Combinatorial Methods in Materials Science (Takeshi Maeda, Hideyuki Otsuka, and Atsushi Takahara).